Artisan Builders is a second-generation family owned general contracting company with a focus on high performance homes and fine carpentry. We offer both design and construction services and operate a custom cabinet shop. We strive to build beautiful, resilient buildings with the lowest possible environmental footprint. Our homes are part of a greater environment and our decisions about how to build should reflect this fact. We pay living wages to all crew members and encourage a healthy work-life relationship. Whether we are renovating 1800’s homes or building small super insulated net zero houses we bring a passion for craftsmanship and the environment to our work - we believe in what we do. Our new homes use a small fraction of energy compared with conventional code-compliant construction. We make every effort to do this using materials and techniques which minimize the global warming potential and embodied energy of our structures. This essentially means minimizing foam use, being creative about foundations - concrete and steel have large carbon footprints. As well as sourcing materials locally whenever possible. 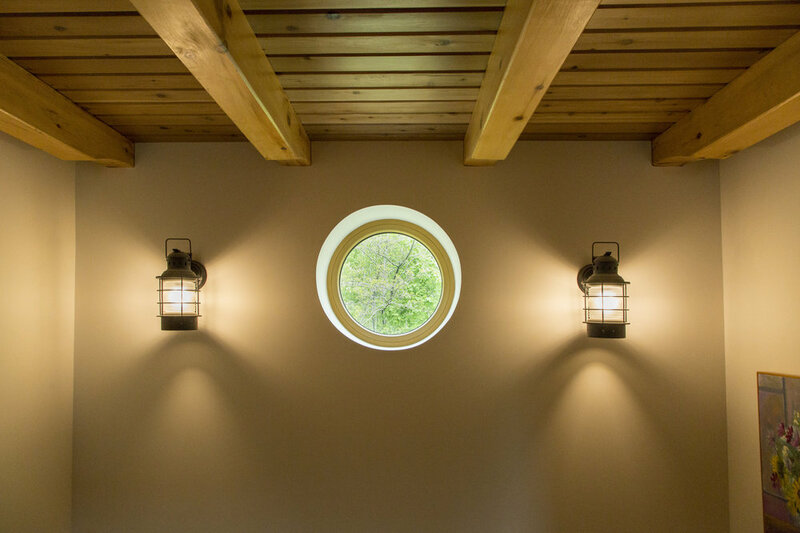 Our construction methods were developed over years of building net zero and passive houses and working with European windows and doors. We strongly advise people to incorporate universal design into their homes, or in other words build a house that one can age gracefully in. This means designing a house to at least have the potential for single story living as well as door openings large enough for wheelchair access. The last decade has seen all sorts of exciting work in the building science community - both in the Passive House community as well as the larger grant-based building science community. Now more than ever there is really good information available from many sources about best practices and new materials and methods for construction. Gone are the days of rules of thumb and simply trying to follow code in order to build a good house. In order to achieve our ambitious goals for energy use and resiliency we incorporate the following elements into our buildings. Super insulated envelope - In most cases avoiding use of foam except below grade. Utilizing either double stud walls (R-43), “Klingenberg walls” (R-58), Smart strapped walls. Roofs are typically insulated to R-72+ with blown cellulose. Typical sub slab or basement wall insulation levels are between R-24 and R-40. Generous eaves and other critical water management elements such as rainscreen gaps, kickout flashings and a sensible height above grade. Resilient materials that can be recycled at the end of their life, require minimum upkeep, have low embodied energy or are made from recycled materials. Local materials - We have relationships with a number of local mills and believe strongly in keeping business as local as possible. Local materials include but are not limited to; rough sawn spruce or hemlock framing, native white cedar decking and trim, pine for timber frames and trim, hardwood for flooring and cabinets. We also have access to locally quarried granite for countertops, tile work or landscaping. Maine has some of the oldest housing stock in the country and also once had the largest timber industry in the world. As a result, many of the houses in Maine are well over a hundred years old and were built during a gilded age of wood craftsmanship. In order to build a modern high performance house which fits into this architectural context we borrow elements from a pallette of specific styles and techniques that were popular throughout the 19th and 20th centuries. Greek and Revival - wide exterior trim details with proportions that relate to the height and width of a building. These proportions are derived from ancient greek buildings and have not changed for thousands of years. Timber Frame - Large beams joined with age old techniques and tools. We have had many successful projects which incorporated beautiful timber frames into super insulated buildings. American Craftsman - an architectural movement that began as a response to industrialization in the late 1800’s. More common out West. There are still many examples in the Northeast. Some examples of craftsman details include tapered columns such as box newels, large eaves with exposed rafter tails and ornamental brackets. Often simple and elegant as well as highlighting skill in joinery. Shingle Style - incorporates wooden shingles as a dominant exterior element replacing wide trim boards. Often achieved through woven “cottage corners” or shingled posts combined with craftsman elements and shingle patterns. Shaker Style - Simple, well designed without all the bells and whistles. The original minimalist style. Mostly known as style of furniture but also applies to casework and doors. Most houses, even those built hundreds of years ago borrow elements from different styles and combine them to create something unique. There is usually, however a unifying theme. The design process can be daunting for some folks or really exciting for others. We are happy to work directly with you or with an architect. In our experience it is best to use an integrated design approach - this is a sort of a from the ground up way of having the builders and subcontractors who work on site help with the design in order to make construction as efficient as possible. In practice this means having all the subs get a chance to review and comment on the plans so there is a chance to make revisions before work begins. This requires lots of communication and long standing relationships with electricians, plumbers, solar installers, code officials and all the other interested parties.